In New Hampshire and Wisconsin, over 20 percent of health care services are twice the national average price. While in Arizona, Florida, Maryland and Tennessee, over 90 percent of health care services are priced lower than the national average. There is no systematic pattern to healthcare prices. There’s wide pricing variation for the same procedures within states as well as between states. Knee replacement surgeries average $57,504 in Sacramento and $30, 261 in Riverside. Arizona’s prices are 18% below national averages. Next door in New Mexico, prices are 25% above national averages. Imaging, radiology and lab tests experience the greatest pricing variation. Commenting on HCCI’s findings, National Public Radio reporter Alison Kodjak described healthcare prices as "crazy." Right Care. Right Time. Right Price. The procedures included in the HCCI report are routine. They occur with great frequency and high certainty of positive outcomes. 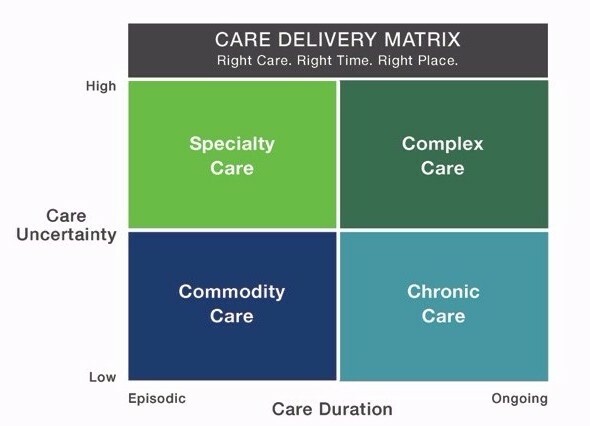 The chart below categorizes care by its duration and uncertainty. Episodic, low-risk procedures fall into lower left quadrant, commodity care. These procedures are at the greatest risk for standardization and transparent pricing. Each quadrant requires a different business model to compete in post-reform healthcare. One size will not fit all. Business models for all types of care (commodity, specialty, complex and non-acute) must operate efficiently to win business and maintain market share. Organizations that deliver superior specialty and complex care will enjoy premium pricing. Customers with high outcome uncertainty will seek care at prestigious tertiary care centers with established expertise, top performance ratings and sterling reputations. Achieving a successful outcome will be their principle selection criterion. Price will be secondary. Once upon a time, knee replacement surgery was high-end specialty care. Few institutions had the expertise, experience and protocols necessary to perform this complicated procedure. Outcomes were less certain. Customers paid premium prices. Today, knee replacement surgeries are performed in high volumes routinely at hospitals and ambulatory centers throughout the country. There’s abundant comparative data on outcomes, prices and customer experience. As a consequence, knee replacement surgeries have become routine. This is the underlying reason Medicare is implementing “bundled” pricing with 90-day warranties for these procedures. Prices initially will coalesce at Medicare’s fixed price and then move lower as higher-performing centers achieve the best outcomes with greater efficiency, higher quality and lower costs. Irrespective of industry, consumer perceptions of quality shift from outcomes to convenience, price and customer experience as products and services commoditize. Health companies that understand their providing commodity care will transform their operations to a better customer experience at lower prices. The reality of impending price competition for routine procedures has not yet materialized within the corridors of the nation’s health systems. It’s still a fee-for-service world and the Job 1 is optimizing revenue for procedures performed. Health systems employ legions of analysts to staff high-performing revenue cycle departments. They measure success one claim at a time. Health systems employ other analysts to build algorithms to predict potential high-cost users of care services. Under risk-based payment models, these patients can generate operating loses if their care is not managed effectively. Predictive analytics is important work. Analysts comb through claims data, electronic medical records, census data, poverty data, household data and unstructured data (e.g. physician notes) searching for correlation and meaning. By contrast, health systems expend almost no effort trying to understand their pricing competitiveness. High-quality data streams like Guroo that provide accurate commercial pricing data are even on their radar screen. It’s almost as if they don’t want to know the answer. Imagine if health systems redirected their super-smart analysts to discover methods for providing better healthcare services at lower costs. Hospital prices for routine care will not remain “crazy” indefinitely and most healthcare is routine. As Barry Arbuckle observes, healthcare prices are normalizing. They’re moving toward market-based levels. This is as it should be. American consumers deserve great healthcare services at true market prices. Health company executives should be losing sleep developing strategies to improve competitiveness in tangible ways. Instead there’s too much complacency. Most health systems are still following the old fee-for-service playbook. The good times won’t last forever. American consumers are value-seeking machines and they’re beginning to turn their attention to healthcare. It’s inconceivable that Americans will continue accepting such wide pricing variation for routine care. Customers will flock to high-quality, lower-priced providers. Fighting price normalization is like fighting gravity. Market forces will win. Health companies that cannot deliver value-based care should be very afraid. Over time, they will lose relevance and disappear. Health companies that deliver better, more convenient healthcare services at lower prices will grow and prosper. They will win marketshare and build customer loyalty by delivering value-based care, not by exploiting arcane reimbursement formularies. Outcomes Matter. Customers Count. Value Rules!